Dansc: I was once told that the shape shown at L-group shouldn't be called an 'L group' but a certain comb formation. The term 'L group' supposedly actually refers to a bent four shape. What's the 'official' name of this group? Dieter: It's called L-group in Davies' work. Since that work has been the first source for Western knowledge of life and death, everybody calls it that way. Bill: The bent four shape is an eye shape, which consists of empty points. Calling it a group of any kind would be misleading. Also, it is not a comb formation because there is no cutting point. Bill This is the comb formation in the corner. Note the cutting point at a.
BTW, Western information about life and death goes back at least to Korschelt. Also, Go Proverbs Illustrated, which has a wealth of life and death info, predates Davies by several years. Black 1 tries to make the eyespace as large as possible, but it is not large enough. 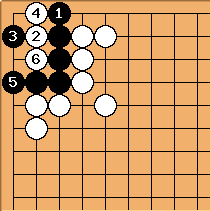 After White 6, the position may at first sight look like a seki, but closer inspection shows that Black is again dead. See Rectangular Six In The Corner. aLegendWai: That seems to be a hard approach to capture B. Why not the following approach? unkx80: You are right, but if it works, it works. Either way will do. aLegendWai: Simpler is better. It helps to lower the mind-work. When one realises the group is dead, it won't play out all the variations stupidly but leave all as ko threats. So count if your approaches give your opponent more ko threats. Complex variation is worse than simple variation. It is true especially for beginners, and especially in fast games. Complication can create more mistakes. aLegendWai: is the vital point of the bulky five. One can remember this tactic - bulky five shape, and can deal with 3 attempts (Attempt 2, 4, 5). Note that no combination of edge hanes and outside liberties help Black. 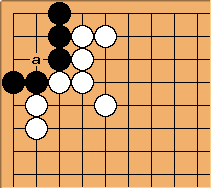 The same sequences given above still work for White. aLegendWai: It needs clarification here. What do you mean by outside liberties can't help B? One example is if W outside group lacks of liberties, it is possible for B to capture W before W does so. Bill: What you say applies to the case when Black has no outside liberties, too. Do you see any diagrams of semeai here? No. Semeais are not the question. 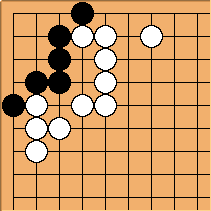 Whether Black can form a living group is. There is a convention that stones that frame a problem position are alive. If their life or death is in question, you would see stones around them that threaten them. If the outside group lacked liberties, we would see that fact in a diagram. Whether the Black group has extra liberties or not. No further clarification is required. unkx80: That is conventions in life-and-death. aLegendWai: Re-read the statements again. It seem edge hanes and outside liberties here refer to the same case. I view them separately. I supposed edge hanes in one case (with diagrams). outside liberties is another case. And this let me think more about issues relating to outside group and escape. Forget my misunderstanding. Delete my question later. grolich: Actually, the statements about hanes and outside liberties do NOT refer to the same case, but rather separately. You are right about that, you simply did not understand what was meant by "outside liberties can't help", and so you tried to form (understandably so), a rather artificial situation where some invisible stones threaten the surrounding group. However, if that were the case, pretty much ANY problem position could be overthrown and labeled "incorrect". Many shapes that are usually considered alive, actually change their status as they start losing outside liberties. the status can change from totally alive, to ko, to just dead, even if the inside shape has not changed at all (A good example would be the rectangular 6 in the corner shape: it is normally considered alive, but as its outside liberties get filled, it goes from alive, to being killable in a two step ko, to being dead if the opponent plays inside (actually, in that case, with more outside liberties, there is a way of looking at it as a 3 and 4 step kos too, but it means virtually alives)). Conversely,some dead shapes which are almost completely surrounded are considered either alive or, frequently, alive or dead in Ko, instead of just dead. In the case of the dead L group, however, the meaning of the statement was that even if black has many more outside liberties, the state of the group as dead does not change. The Marked outside liberties are what was meant by the statement, and you were correct in your initial thought that it is a separate issue than the hanes. 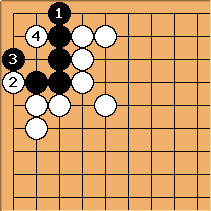 In Go problems, it is normally an assumption that no stones which are not visible in the diagram affect the diagram.